Women from Franconia and Eastern District conferences attach symbols of healing to an oak tree at this year’s Beauty for Brokenness seminar. Photo by Anne Yoder. On the morning of Saturday, June1st, thirty women came together at Salford Mennonite Church in Harleysville (Pa.) for the first women’s equipping event sponsored by the new Eastern District & Franconia Mennonite Conferences Women’s Committee. 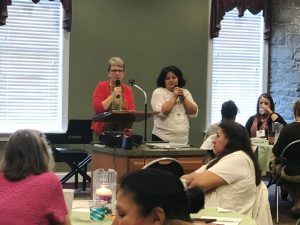 Angela Moyer, co-pastor of Ripple congregation (Allentown, Pa.) and occupational therapist at Good Shepherd Rehabilitation, spoke about melding a clinical model for recovery from trauma with the story of Christ to bring healing for hurts, whether small or truly traumatic. 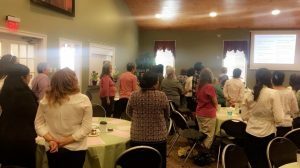 She explained how we can choose to “act in” by doing things destructive to ourselves or “act out” by doing things that are destructive to others, or we can choose to heal by taking positive steps toward forgiveness, reconciliation, and peace. 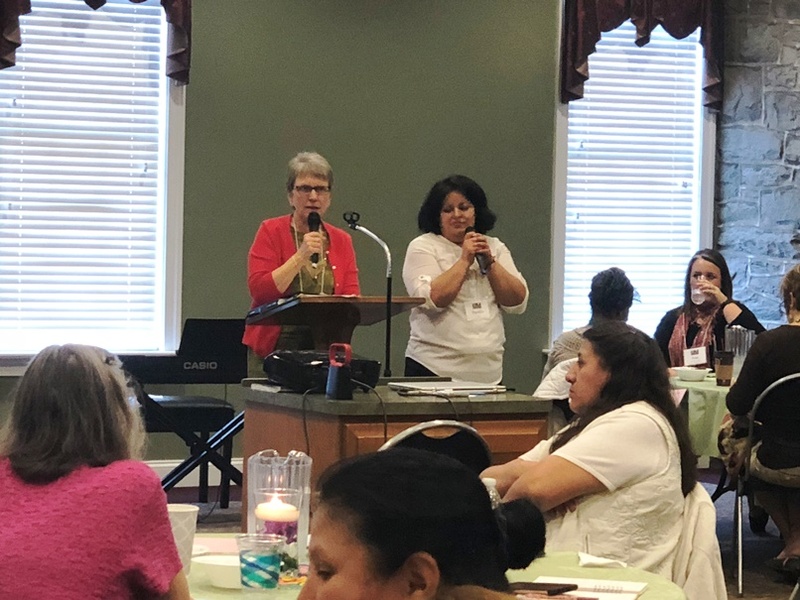 Sister Mary Julia McKenzie, chaplain at Penn Foundation’s Recovery Center (Sellersville, Pa.), spoke about the work of recovery, especially as it relates to drug and alcohol addictions. 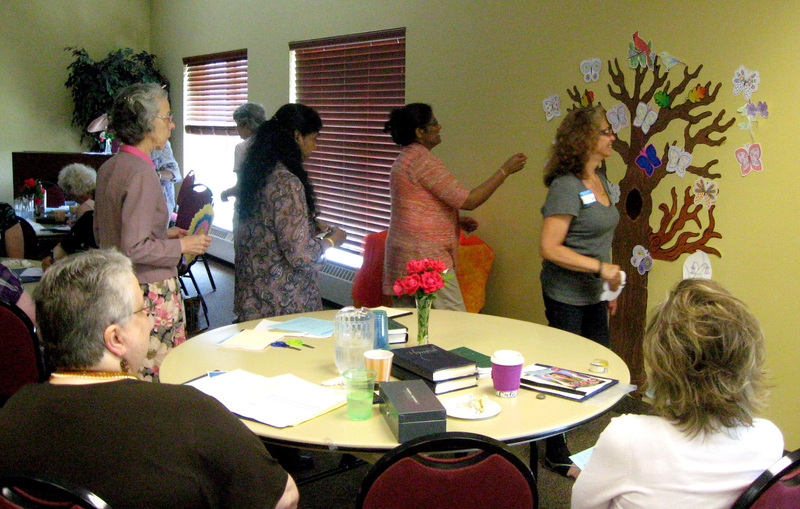 She shared a poem about an oak tree as a symbol of resilience in the face of trials, then invited the participants to decorate items to be placed on a drawn oak tree as a part of the closing worship time. 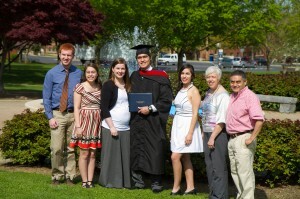 Phyllis Chami shared a devotion she had written about Eve and Mary, two women of God. The devotion came out of her own personal trauma and how God has played a part in her growth toward wholeness. Lynne Allebach also shared the story of the loss of her son and how the care of others aided in overcoming her grief. Participants met in small groups to discuss their own trauma experiences and their need for recovery. The morning ended with a time of worship that included a version of “Beauty for Brokenness” with words written specifically for the gathering. 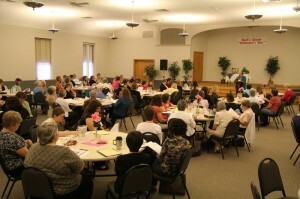 Franconia and Eastern District Conferences sponsored a seminar last year on training women for relationships of mutual care. 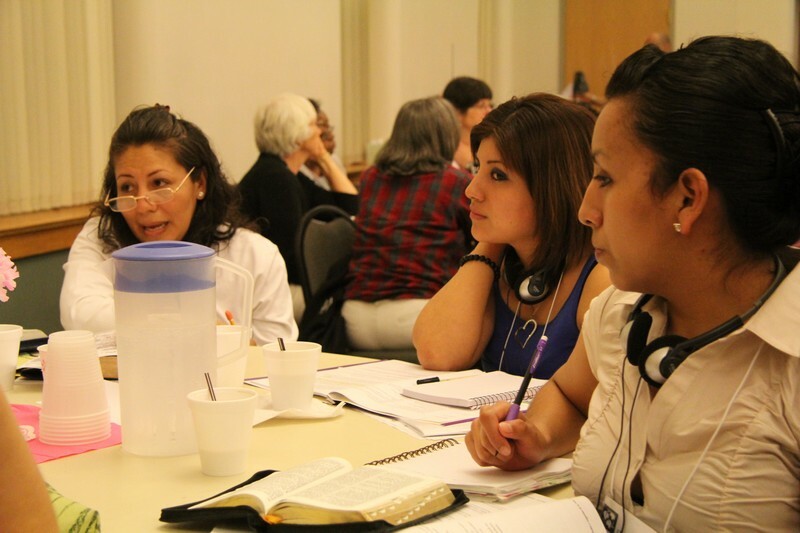 Responses to a survey taken after the training indicated an interest in continued equipping gatherings that address the needs of women. 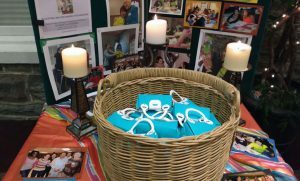 Anne Yoder, West Philadelphia congregation, answered the call for ongoing ministry and assembled a committee to begin brainstorming ideas. The theme of Beauty for Brokenness was chosen as a motif for the June event as a way of examining trauma and seeing how people may grow toward wholeness from places of brokenness. To join the planning team or to receive information about future gatherings, please e-mail Anne Yoder at ayoder1@swarthmore.edu. 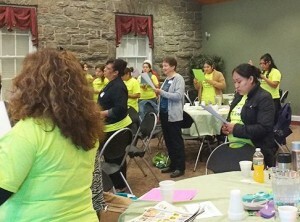 Women from all over eastern Pennsylvania met in March of last year for SisterCare. Photo by Emily Ralph. 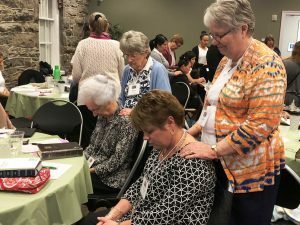 The Women’s Committee of Eastern District & Franconia Conferences is planning a morning apart for women in June with a focus on wholeness and healing. 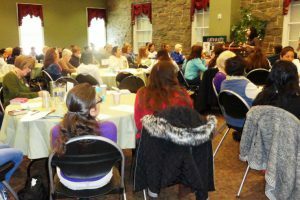 In March of last year, 130 women attended the Sister Care Seminar held by Mennonite Women USA at Souderton Mennonite Church. 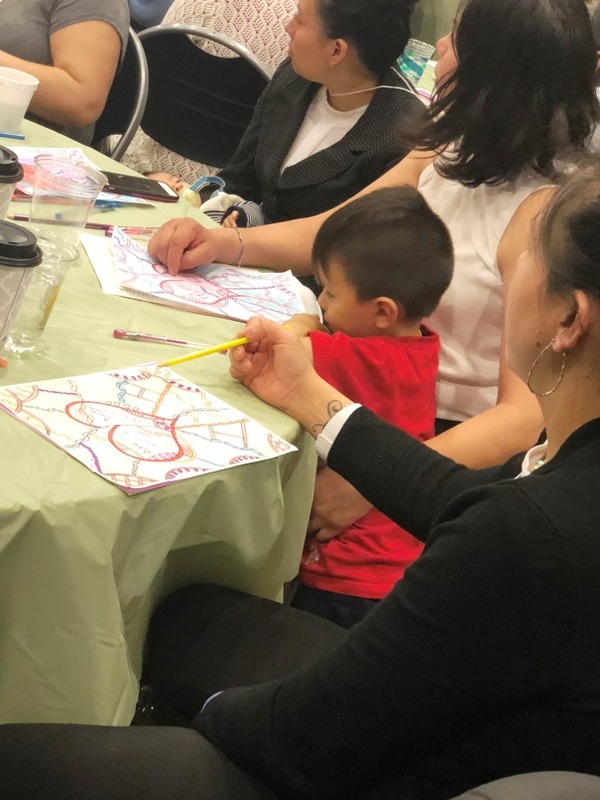 Attendees were enthusiastic about the teaching on caring for self and others and asked for continuing opportunities to explore these topics and to encourage one another on the local level. In answer to this call, the Eastern District & Franconia Conferences Women’s Committee has formed, and is holding its first event “Beauty for Brokenness: Growing toward Wholeness.” This event will focus on how women may identify areas of brokenness in their lives and move toward the wholeness God intends for us all. 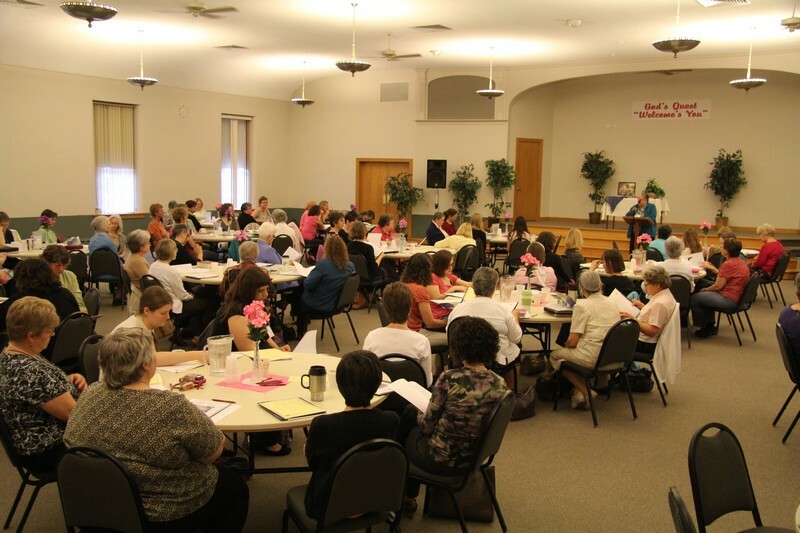 This is the first of what we hope will be many chances for women of Eastern District and Franconia Conferences to learn together, share our stories and wisdom with one another, and support each other. 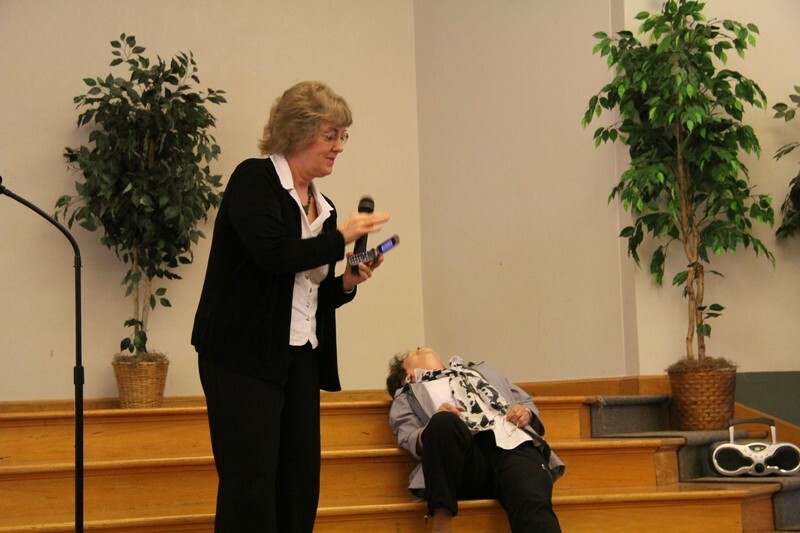 Last year’s SisterCare seminar focused on women ministering to other women. Photo by Gay Brunt Miller. Pastor Angela Moyer, from Ripple Allentown, will present on recovery from those things that keep us from growth toward wholeness. Sister Mary Julia McKenzie, chaplain for Penn Foundation’s Recovery Center, will share about her experience of working with women recovering from mental health and addiction issues. There will be music, speakers telling their personal stories of overcoming trauma, and opportunities to share in small group settings. Light refreshments will be served. No child care will be available during this event. A $10 fee will be charged for those who can afford it. 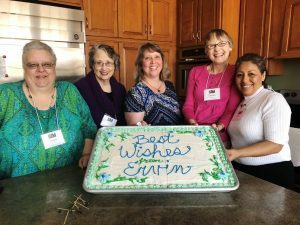 The Eastern District & Franconia Conferences Women’s Committee is made up of Lynne Allebach, Joyce Hunsberger, and Anne Yoder (Coordinator) and operates in cooperation with Mennonite Women USA. The committee is actively looking for additional members. Mark your calendar for Saturday, June 1, 9:00 am to 12:30 pm, at Salford Mennonite Church, Harleysville, PA. To register, go to women.franconiaconference.org. 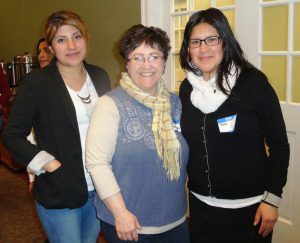 One hundred and thirty women gathered for training and fellowship at Souderton Mennonite Church on March 23-24. 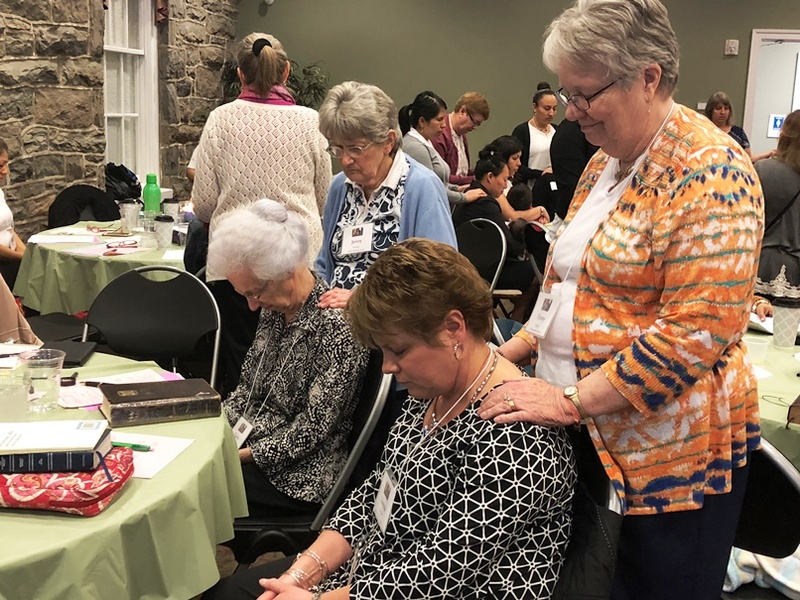 The Sister Care seminar, developed by Mennonite Women USA, was sponsored by Eastern District and Franconia Conferences as part of their continuing work to equip and train congregational leaders. 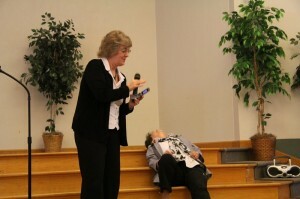 Vicki Cook “collapses” in frustration after Rhoda Keener fails to follow the principles of active listening. Photo by Gay Brunt Miller. Souderton’s Sister Care seminar was groundbreaking for Mennonite Women USA—it was the first time they have used materials translated into Spanish; Spanish-speaking participants were also equipped with translation headsets. As a result, the seminar was well-attended by Spanish-speaking members of Philadelphia Praise Center and Nueva Vida Norristown New Life. 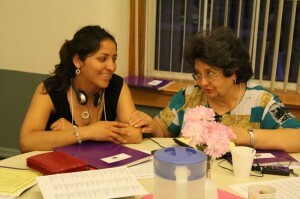 Leti Cortes (left) shares with her table during group conversation. Photo by Emily Ralph. 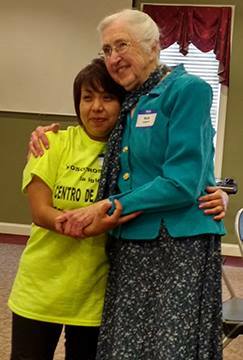 For more information on Sister Care, visit Mennonite Women USA’s website.